Don't these flowers just make you smile? 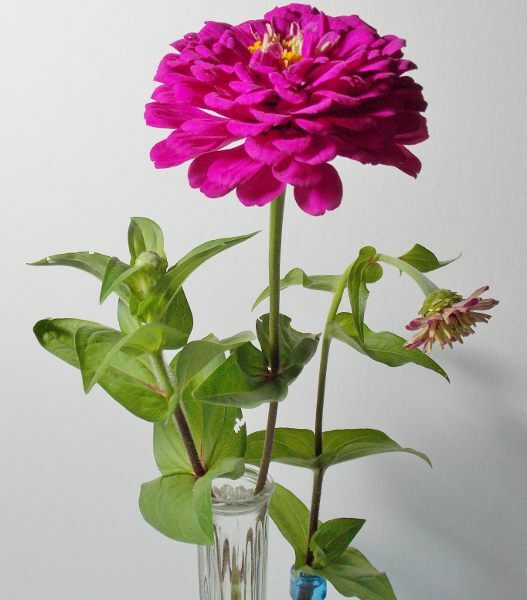 :) I always like to plant zinnias in our vegetable garden each summer. They provide many sunny bouquets for our kitchen table and windowsills as well as attracting the bees and butterflies to pollinate the plants for a good vegetable harvest. This summer has been a good tomato year so while the zinnias have been blooming, I have been busy making spaghetti sauce to freeze and yesterday canned a few jars of San Marzanos for a "taste of summer" during the winter months. Though I am very thankful for a productive garden, I also know that tending garden produce will be my first priority and I have little time to draw the flowers that also come and go so quickly these days. A sketch here and there is about all I can have the time or energy for. But I've had my eye on these these pinky-purple beauties, Benary's Giant zinnas, all season and decided it was time to cut a good specimen to study. After taking lots of photos and making sketches and color studies deciding on the right color "recipe", I hope to be able to complete a botanical portrait after the garden is put to bed.